CallConnect has a seasonal treat for young people throughout this summer’s school holidays. The service is offering passengers aged 18 and under special £1 bus tickets for one-way journeys on pre-booked CallConnect services across the county from Saturday 21 July to Monday 3 September. That means young people living in rural areas and remote communities can meet friends, enjoy activities, go to work or the shops, and link up with other transport services without breaking the bank. The ‘One Pound One Way’ initiative returns after scoring a major success last summer, often saving younger passengers several pounds each time they travelled. Councillor Richard Davies, Executive Member for Highways and Transportation, said: “We know that younger people can struggle with transport costs, particular those living in the most out-of-the-way parts of the county. “So we’re offering them cheaper fares over the summer so they can get out and about and make the most of the school holidays. “All you have to do is register to use the CallConnect service, and it’s free to join. 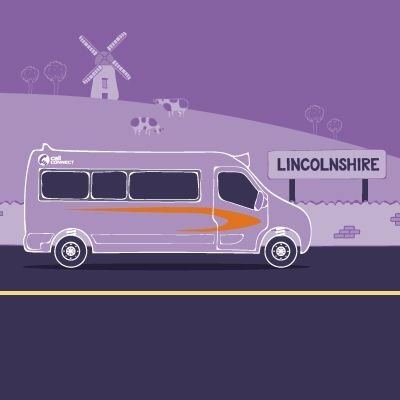 The £1 fares will be available Monday-Saturday during service operating times throughout the whole of the Lincolnshire CallConnect network. Proof of age may be required by drivers such as a passport, citizen’s card, drivers licence – for more details, please call the booking centre on 0845 234 3344 or 0845 263 8153 for the Welland area. For up-to-date information and other offers, go to www.lincsbus.info or follow @callconnectbus on Twitter. NextLincoln Eastern Bypass Archaeology goes on tour!